Who are you? Eoin Furbank and Jessica Jordan-Wrench. Why Margate? Because it’s beautiful, exciting, exhilarating and probably the most interesting place in the UK right now. First Margate memory? Standing on the Cliftonville promenade in the early hours of a winter morning, dodging waves crashing over the wall, wondering what we would find when the sun came up. Best & worst thing about renovating the new bar? Time and money limitations meant we were working ridiculous hours (alongside our amazing, amazing friends) to get it finished within a week. However, the constraints made us more inventive, imaginative and driven. Biggest extravagance in the theatre / bar? A snow machine for our Christmas show in 2009. The day after we bought it, the weather turned and it proceeded to snow every day of the run. Object of desire for the theatre / bar? Nick Cave. Who are your heroes? Steve Albini, The TEAM, Bella Tarr and a thousand others. Best advice you’ve been given? Fake it till you make it. If you were an animal what would you be? A werefox. What couldn’t you live without? Our friends. What’s the best thing about running a theatre? Sitting at the back of a full auditorium, watching an audience love a show. What would you do if you were mayor of margate for a day? Re-instate the tramway from Westbrook to Northdown Road. Would you describe yourselves as drama queens? No. But we do have a “Drama Queen” mug that is issued if anyone throws a hissy-fit. Who would you like to be stuck in a lift with and why? MacGyver. Because he’s part boy-scout, part genius, all hero; you wouldn’t be in that lift for long. Where do you go for a night cap? Forts, for rhubarb vodka and the most incredible ice-cream we have ever tasted. What do you collect? Instruments, animal masks, records. What’s your biggest weakness? Hot buttered rum. If you could have centre stage in a play / band / film what would it be and why? Rather than centre-stage, we would like to be Daniel Johnston’s backing band. He’s one of the finest song-writers of our time and an over-whelmingly brave and talented performer. What are your goals for 2013? To fill the theatre with outstanding work (and audiences). 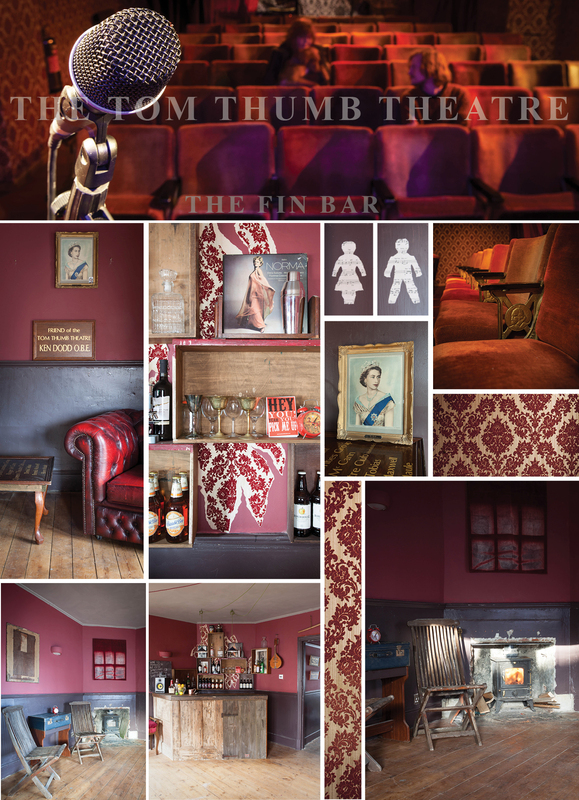 ROUND-UP: Originally a Victorian coaching house, this tiny theatre is known as one of the UK’s smallest venues, The 50-seat venue started operating as a theatre in 1984 and is entering into a new phase under the direction of Jess & Eoin who also run theatre company .dash. 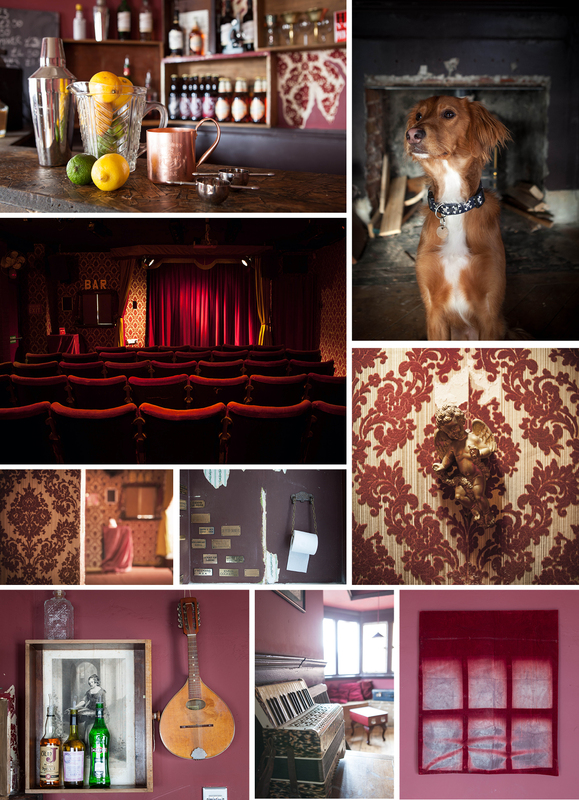 Downstairs a quirky ‘twin peaks-esque’ red room, flock wallpaper adorned walls, bijou and characterful. Upstairs a a quirky little bar put together using a ‘waste not want not’ philosophy – using materials found on site & donations from friends. There is a growing collection of curiosites & ever increasing ingredients for newfangled cocktails. The ‘FIN BAR’ is born.